Visa applicants will face problems because of the high score requirement in points test. This could lead to reduced skilled migration similar to the situation in 2017. 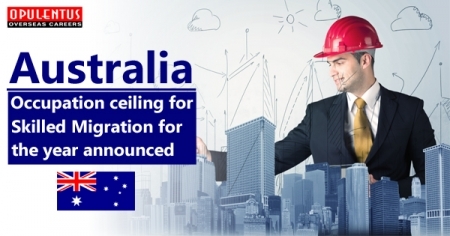 The Home Affairs Department has announced the ceiling for occupations for 2018-19. There is no change in the migration planning levels and also in the quota for individual occupations for the present year. Many prospective migrants hoped of seeing some adjustment in the quota of certain occupations which have a high demand. They were expecting the adjustments for ensuring that applicants of jobs like the IT professionals and accountants, who face a high threshold in points to get relief. Moreover, the first round of invitations issued for visa applicants failed to be encouraging. The invitations of last year for some occupations were few. There was a hope that in the start of the year, the number of invitations would escalate. This has not happened presently. Looking at the number of invitations issued presently, and proceeding at this rate, the intake in immigration is likely to be very low. There are many places (16,741), reserved for registered nurses but the invitation has gone out for 105 in June and July for submitting the visa applicants. Applicants for accountants require having 85 points in the point’s test, to get an invitation, and their total need for the year is 4,785. Accountants, engineers and IT professionals will have a tough time during this year also. The best move is to move towards trade courses or to other states which present better opportunities. In 2017, Australian migration intake touched a ten-year low and the country had a reduced number among permanent migrants by 20,000 compared to the figure of the previous year. The immigration level for 2017-18 was 190,000, but the numbers of visas issued were 62,417 only.